If you're looking for a smart automobile, both in functionality and style, visit us at WestStar Chrysler Jeep Dodge in Monahans. One car you will want to check out is the Chrysler 300. The 300 comes complete with a set of enviable interior features. One of the Chrysler 300 interior features is Uconnect. Uconnect is an incomparable infotainment system that includes Android Auto or Apple CarPlay, depending on your needs. It also comes with a 8.4 inch touch screen. 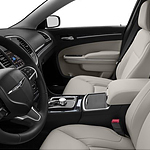 The Chrysler 300 comfortably seats five, in either high quality cloth or leather upholstered seats. Both driver and passenger seats are power-adjustable. The 300 has amazing stowage capacity. The trunk has 16.3 cubic feet of space. The experienced team of professionals at WestStar Chrysler Jeep Dodge is ready to show you the latest Chrysler 300. You can test drive the 300 any time that is convenient for you.